The bee orchid has to be one of our most exquisite wildflowers. At first glance its exotic looks may make it seem like an interloper from far flung shores — but this is a native Irish plant through and through. In Ireland bee orchids tend to flower during June and July. They occur mainly on dry, sandy, calcareous soil — particularly on or around dunes and limestone pasture. A perennial, the plant develops a small loose rosette of leaves in autumn and will continue to grow slowly through the winter. In late spring or early summer it will throw up a flower spike from this basal rosette that will eventually sport from one to twelve flower heads (but usually around two to four). Each individual flower is beautifully formed. Three spreading deep-pink sepals frame two short, stumpy green petals and the large, distinctive bee-like lower lip which is reddish-brown, furry, and patterned with greenish yellow marking. Two bright yellow “pollinia” — pollen masses Very occasionally a white derivative of the species may be seen — without the pink pigment in the sepals, but retaining the distinctive bee-like furry lip. Bee orchids are among a small group of orchids that mimic insects to entice pollinators. The scientific term for this pollination strategy is “pseudocopulation”. 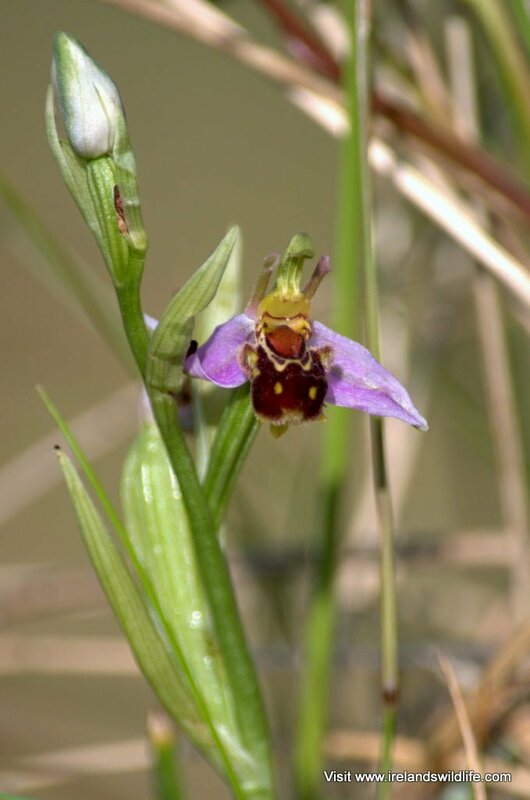 The bee orchid mimics both the scent and appearance of females of a select few species of solitary bee. The scent entices male bees to investigate, and in their confusion they attempt to mate with the visual mimic presented by the flower’s distinctive bee-like lower lip. The beguiled males move on to visit other flowers and thus pollinate the bee orchid. While pseudocopulation is an interesting strategy, bee orchids are also perfectly happy to self pollinate. Here in Ireland, where the plant is approaching the northern limits of its range, self pollination is thought the be the primary pollination method for the flowers. Finding a bee orchid is a rare treat… and when they are in flower there really is no mistaking them for any other species. They are a plant that absolutely warrants a “down on the hands and knees” look to reveal the exquisite detail in the flower. If you have a magnifying glass or hand lens handy, so much the better — the flower certainly doesn’t disappoint on closer inspection. The bee orchid is widespread across central and southern Europe, into North Africa and the Middle East. Its range stretches from Portugal and Ireland in the west, east as far as Iran and the Caucasus. It is common in the Mediterranean region, but becomes far less common in the northern reaches of its range. Here in Ireland it is scarce, but fairly widespread, and can be found in suitable habitat in many parts of the country. Despite its distinctive appearance it is a remarkably unobtrusive plant, and can be surprisingly difficult to find unless you look very closely. Although it is a perennial it is unusual in that it flowers inconsistently. Some years it may appear in numbers at a particular location, but may not flower again for several years.